The patient was a 27 year old intoxicated male who was uncooperative with police in France. The offending object is a Taser dart, which was fired at him for control. The dart was not noticed when he was released from custody, and he later presented to hospital with a headache! 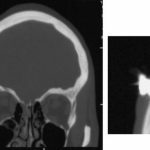 The dart was removed by a neurosurgeon and he was discharged uneventfully a week later. Reference: A brain penetration after Taser injury: controversies regarding Taser gun safety. Forensic Science International, ePub 21 April 2012 ahead of print.